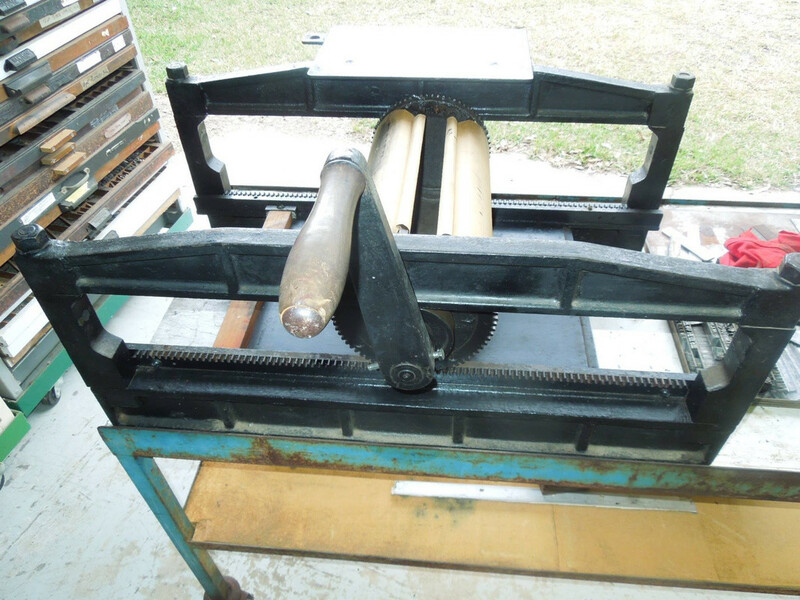 Does anyone know what brand of galley press this is, there are no markings anywhere on it. Also is there an adjustment for setting type high or does it just run over the type by its own weight. It is binding on the top guide runner and appears to be higher on one side than the other. I've never seen one like this. There is no obvious adjustment, you can see that the roller is held down by plain wheels at each end which run against the top bars of the frame. It looks like the original version of the Vandercook No. 1, indicated by the double trusses. See Vandercookpress.info website. I think that the picture may be of a Solna Proofing Press. When I was apprenticed compositor at Billing & Sons of Guildford in Surrey, Mr Jack Balchin was the Press Proofer. One day in about 1955-56 I was instructed to be the Boy to change some battered sorts in a forme on the press and proudly done so. Unfortunately I left my typescale where the flat pieces beside the cog runners move as shown here. When he motioned the cylinder for a proof, the end of the ruler became trapped in the wheel and jammed it solid. The Engineers Department was required to raise the cylinder and remove it. The cog tooth took the pice of steel out the typescale but it lasted me a life time still! Much bad language improved my vocabulary that day and I certainly was more careful in the future.The typescale bears the scars as pictured to this day. Wayne Messell a Lino mechanic friend tracked it down.